Northern Ireland's biggest operator of single wind turbines, Simple Power, has been bought over for an undisclosed price. Part-owned by construction firm Heron Bros, it has built-up a portfolio of 52 turbines on farms since 2010. The buyer is the Foresight Group, a UK infrastructure and private equity investment manager. 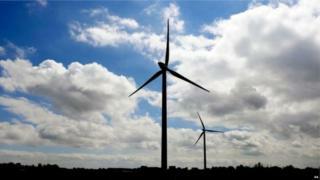 The wind turbines are fully operational and have "shown strong performance to date". Foresight said they have a combined output "in excess of 12MW". Over the past five years, Foresight has overseen £200m worth of investment in the Northern Ireland renewable energy sector, including anaerobic digestion plants. James Taggart, investment manager of Foresight Group said: "Simple Power's wind portfolio is a fantastic acquisition. "We look forward to working with its management team to continue its success."